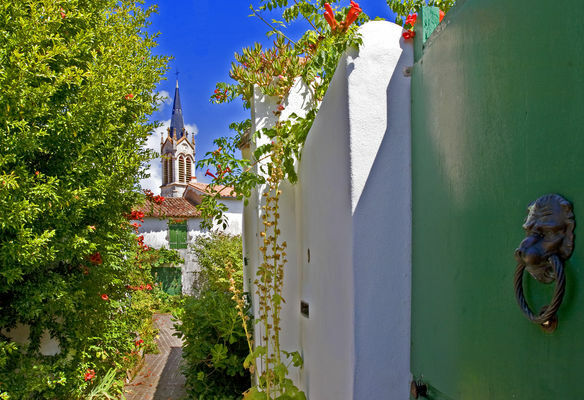 While exploring the narrow streets of our village, discover the origin of the names of its streets. Général de Gaulle, Jean Jaurès, Émile Zola… These street names associated with historical figures exist in a great number of French towns. 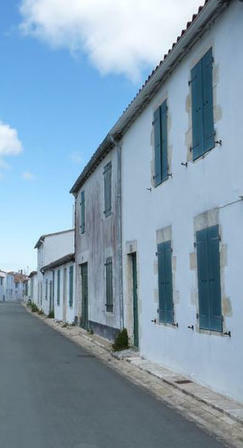 But the streets of La Couarde sur Mer are historical ones too! 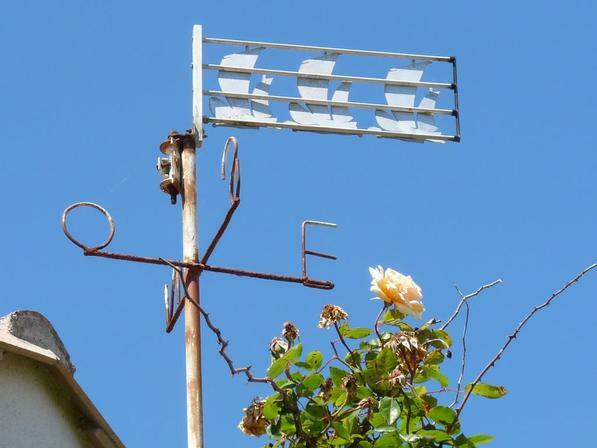 Together with the Rétais dialect and the history of Île de Ré, the street names will hold no secrets for you! Follow the street ‘Rue de l’Évêché’ and then bear left into ‘Rue Grande Aire’, a small narrow street. 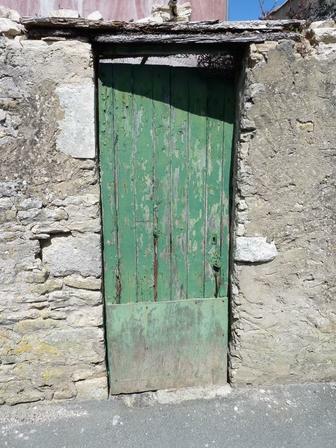 Follow the street ‘Rue des Terroirs’ and walk across ‘Rue de la Motte’. It derives the name from its situation on the highest place of the village. 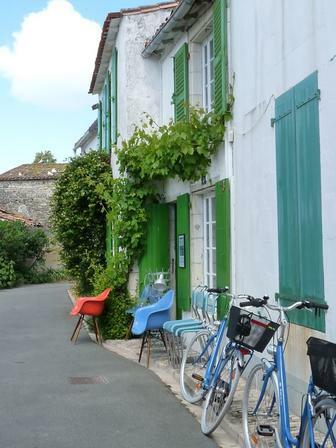 Continue along the small street ‘Rue de la Plage’ and bear right into ‘Rue des Passeroses’. In spring and summer, the village and streets are splashed with hollyhocks. Also called by their botanical name, Alcea rosea, hollyhocks are the classic plants of country-style gardens and a symbol of Île de Ré. Turn left, continue along ‘Grande Rue’, and bear right into ‘Avenue du Moulin des Sables’. There used to be a lot of mills at La Couarde and some of them supplied flour to the village. So there was a mill in this avenue. The last owner removed the sails so that he did not have to pay taxes any more. As a matter of fact, mills had disappeared for tax reasons. Bear right into the street ‘Rue de l’Océan’. Have a look at ‘Rue des Ragoteries’ on the left. 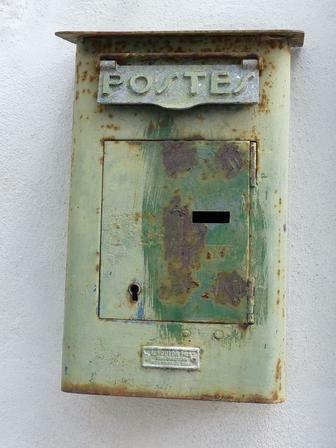 It is widely known that all villages have their own gossip queens (in French, ‘rapporteuse de ragots’). 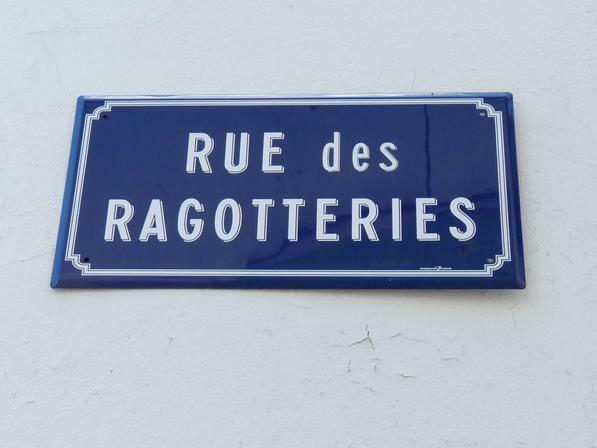 So, a gossip queen used to live in this street of La Couarde, and this is the reason why the name of ‘Rue des Ragoteries’ was definitely appropriate. Continue along ‘Rue de l’Océan’ and have a look at ‘Rue de Beauregard’ on the left. At a time when the village of La Couarde clustered around its church, there was not any building in this place. Therefore, there were open views of the ocean as this part of the village is located in a small hilltop. This is the reason why ‘Rue de Beauregard’ was so called. Bear right into the street ‘Rue Roger Delteil’ and discover ‘Venelle de la Magayante’ on the left. 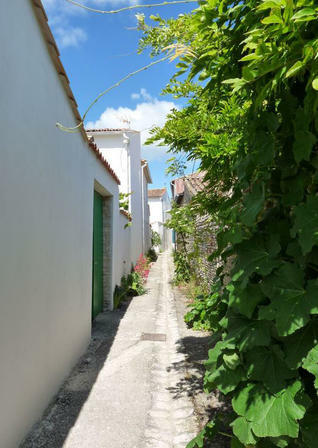 A venelle is a passage way which is generally situated between two major streets. It can be used as a shortcut to the parallel street. Numerous fishermen used to live in that part of the village. Magayant is the former name of the foreshore (estran in French) - the part of the land next to the sea that is between the limits reached by high and low tide. A magayant or a magayante is also by extension the name given to the person fishing from the shore in Île de Ré. 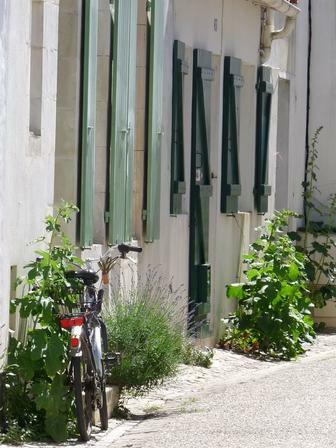 Walk up the street ‘Rue du Ventoux’ facing ‘Rue Roger Delteil’. Sucker (ventouse in French) was the name used to describe the hole in the dune caused by a swirling wind (sorcière in French). In the past, those streets did not have any buildings constructed and were therefore battered by north winds. Anecdote: in 1709, the inhabitants of the village of La Couarde were called ‘sorciers’. Apart from the mocking attitude, the name was indeed a reflection of the inhabitants’ major character trait. In fact, the inhabitants of Les Portes en Ré were called ‘Saboureaux’ (small rose-coloured fish with a poisonous thorn on the back); the inhabitants of Saint-Clément-des-Baleines ‘Sauvages’; the inhabitants of Loix ‘Potets; the inhabitants of Bois-Plage ‘Loups’; the inhabitants of Saint-Martin ‘Faquins; the inhabitants of La Flotte ‘Marochons’ (tool used to separate oysters from rocks); the inhabitants of Sainte-Marie ‘Bourrins’, and the inhabitants of Rivedoux were first called ‘Mahométins’ and then ‘Riffins’ (around 1930). Those names are no more in use except for the inhabitants of the village of Ars who are called ‘Casserons’ (small cuttlefish). Then bear right into ‘Cours des Poilus’. ‘Cours des Poilus’ marked the former village of La Couarde. It goes along ‘Square Bonnin’ where you can view the atypical war memorial of the village. The most common representation was the poilu (WWI French infantry soldier) (bust or real size) with his equipment and taking various attitudes. Here, due to Gaston Bonnin’s determination, the town had decided to erect a monument which is peculiar as regards the theme and the circumstances of its construction. Discover the history of the War Memorial with the tour ‘Découverte de La Couarde sur Mer’. Turn left and discover the small street ‘Rue du Pont’. By the end of the 19th century, there was an open-air waterway going along ‘Cours des Poilus’, and numerous bridges were used to cross it. 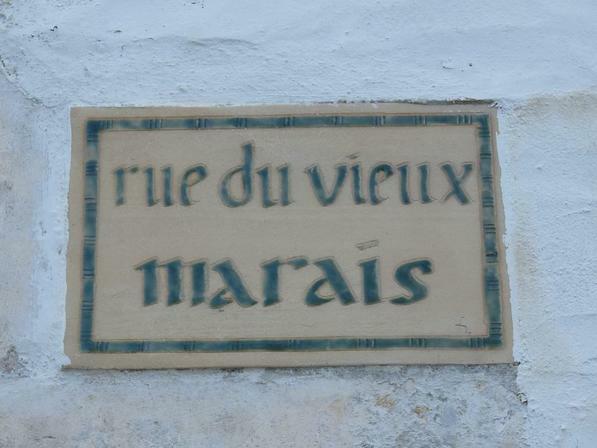 Continue straight ahead and follow the street ‘Rue du Vieux Marais’. A great number of marshlands were found at that place. The history of the village begins with a series of major projects. In 1237, it was authorized to dig a ditch in order to dry out the marshland of Les Marattes because the floods damaged wheatfields and vineyards. The name of the district of La Raigon is derived from this ditch. Turn right, and then left. 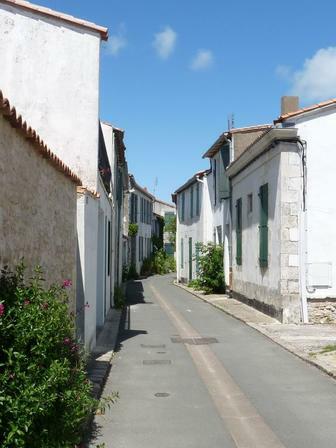 Discover the small street ‘Rue de La Raigon’. The village (district) was formerly situated in the upper part and clustered around the old chapel. During the Ancien Régime, the hamlet was divided into at least four districts: ‘Village’, ‘Dizaines de La Raigon’ (or ‘L’Aragon), ‘La Chapelle’ or ‘La Moizandière”. Then, in the 18th century, it was made up of three delimited urban areas – ‘La Raigon’, ‘La Doux’ and ‘La Couarde’. The name would derive from the Spanish ‘Aragon’. A waterway, also called ‘La Raigon’, could dry out the place towards Les Marattes in the 13th century. Therefore the name of La Raigon has been used with different meanings over the years. To reach ‘Rue des Tuileries’, walk up ‘Rue Charles de Gaulle’ and then ‘Rue des Garennes’. Once you have come to ‘Rue des Tuileries’, discover ‘Venelle du Vieux Chai’ on the right. Bear right into ‘Venelle du Vieux Chai’. This venelle sheltered a wine warehouse. However no vestige can be found nowadays. In terms of viticulture, the wine warehouse is the place where vinification (all the processes of converting grape juice into wine) takes place. Some of these steps are necessary such as alcoholic fermentation, and others are used to mature the wine profile as far as aroma and taste are concerned. At the beginning of the 20th century, the economy of the village was based on the growing of grapes whose produce was exported from the port of Saint Martin. 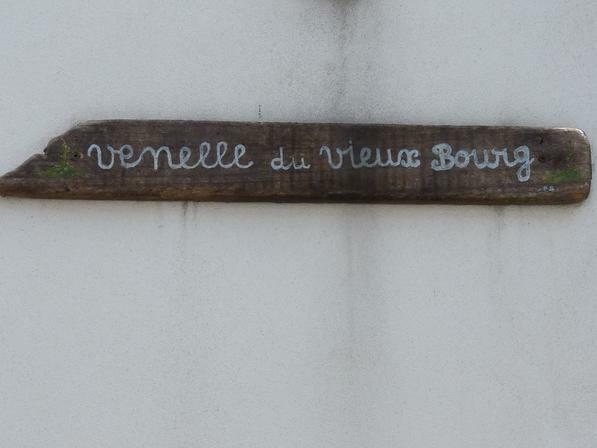 Continue along ‘Rue des Tuileries’, turn left and follow ‘Venelle du Vieux Bourg’. In the past, the district of ‘La Raigon’ sheltered the village around the former church. 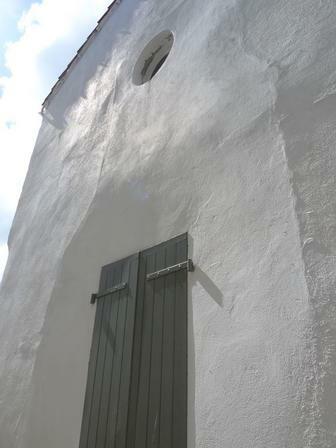 Then the church was moved and built in the centre of the village. The inhabitants gathered around the present-day church thus forming the new village of La Couarde. Do you want to know more about our village? Experience the “discovery tour” and join the guided visit of the village every Friday at 11am. 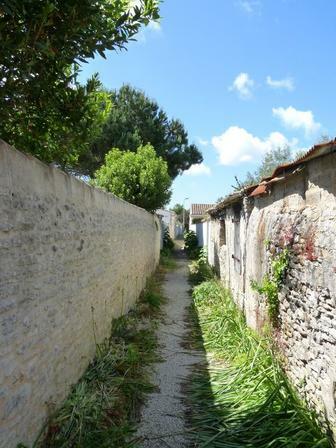 Jolie petite promenade à la découverte des venelles et rues fleuries de La Couarde. Parfait pour se dégourdir les jambes en famille en fin de matinée par exemple, histoire de terminer par un agréable déjeuner en terrasse. Petite promenade agréable qui permet de découvrir l'histoire du village et de quitter les rues principales.